Ahead of today's qualifying session the air temperature is 21 degrees C, while the track temperature is 40 degrees. It remains bright and sunny. That's the air and track temperature sorted, but as for the temperature in the Mercedes garage we can only guess. Either its red hot as the team seeks to fend off the increasing challenge from Ferrari, or super cool, the German team having done a very good job of what Lewis Hamilton claims it never does... sandbag. For a few brief moments in FP3 it looked as though the German team had been kidding us, Valtteri Bottas and his British teammate toppling their Maranello rivals with a couple of very impressive times. But then the Scuderia hit back, and as if the looks on the faces of Toto Wolff and Niki Lauda weren't enough, the overdriving of Bottas and Hamilton reinforced the message... Mercedes is struggling. 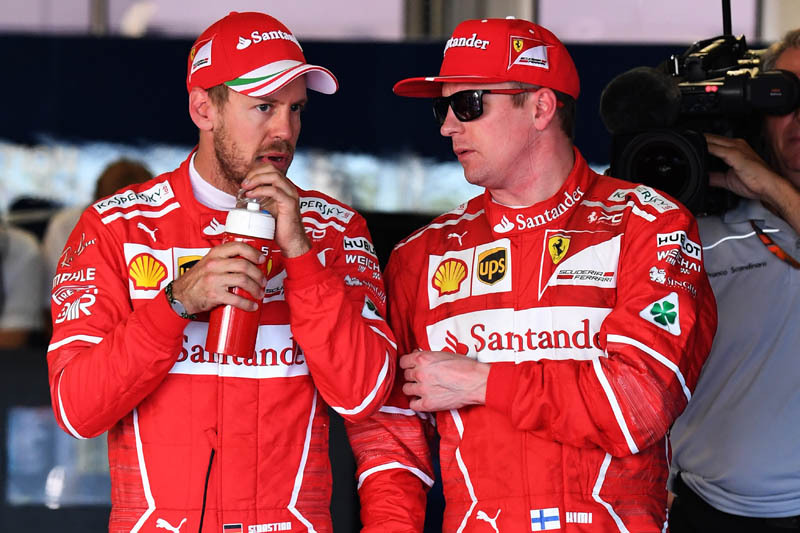 Consequently, as we head into qualifying, the question isn't whether Mercedes can maintain its streak of poles but rather whether Ferrari can lock-out the front row. While then Silver Arrows struggle to get their tyres working in time, the Ferrari appears to be on rails, the red cars not having looked as good in years. Max Verstappen said yesterday that fifth and sixth is the best that the team can hope for, and as the RBR13 - well they did insist on tempting fate - continues to disappoint the question is can Williams or Force India pull off a surprise. Saying that however, the Force India were both well off the pace this morning. Mixed fortunes for Renault, for while Nico Hulkenberg finished seventh earlier, teammate Jolyon Palmer failed to post a time and over the break his crew has had to change his engine. This follows an all-nighter after the team had to build a new survival cell following an issue yesterday - remember that funny smell Vettel detected? Whatever happens over the next hour, Carlos Sainz forfeit 3 grid places for his clash with Lance Stroll in Bahrain, while poor old Stoffel Vandoorne forfeit 15 for having a Honda engine in the back of his car. And then there's Monsieur Moany - this year's equivalent of Captain No Grip - who deserves a grid demotion due to the frequency and variety of his complaints. The big question ahead of the session is not so much whether Ferrari can lock-out the front row but can it take pole without reverting to the ultrasoft tyres. Such a move would be a tremendous gamble. At the same time, locking-out the front row would allow the Italian team to control the race, aware of Mercedes shortcomings in some sectors and its inability to turn its tyres on. The lights go green and there's no hanging around, Sainz keen to get to work as soon as possible. He is joined by nine other drivers, all on the ultrasofts. "Remember we have new brakes on the car," Kvyat is reminded, "good warm up on the brakes." Vettel is on track, on supers. Of the first wave, Sainz is quickest (36.575), ahead of Magnussen, Kvyat and Stroll. A typically bravura performance sees Alonso go third with a 37.026. The guy never gives up. Moments later Vandoorne improves to fifth with a 37.411. As the Mercedes duo head out, on ultras, Raikkonen follows on supers. Ocon posts 36.586 to go second, only to be demoted when his teammate posts 36.185. A 36.201 sees Verstappen go quickest, only to be demoted when Bottas crosses the line at 34.177. Vettel goes second, 0.925s off the pace, but on the harder rubber. Moments later, Raikkonen posts 35.338 to go third. With Massa the only driver still to post a time, Hamilton is currently 19th following his 45.420 lap. While Massa posts 36.142 to go 6th, Hamilton has another slow lap, clearly building for a proper flying lap. As Vettel closes to within 0.366s of Bottas, the Finn improves to 34.041 and Hamilton goes second with a 34.409, 0.368s down on his Mercedes teammate. With 5 minutes remaining, the drop zone consists of Alonso, Vandoorne, Wehrlein, Grosjean and Ericsson. Sainz, Stroll and Palmer are hovering. Other than the leading four, everyone else is on track. Stroll improves to 11th (36.279), as Palmer drops to 15th. Sainz goes 8th from 15th, a great job by the Spaniard. Alonso posts PBs in the first two sectors, crossing the line at 36.353 to go 13th, a magnificent job by the McLaren driver. Out come the yellows as Palmer appears to be in the tyre barrier at T4. Are you OK, he is asked. "Yes, I'm alright," is the early response. Replay shows him hitting the inside kerb at T4 and then spearing across the track. To further confuse the issue at around the same time Palmer was having his problem, Wehrlein had a spin which also brought out the yellows, thereby ruining those laps of those drivers seeking to improve. We lose Palmer, Vandoorne, Wehrlein, Ericsson and Grosjean. Quickest was Bottas, ahead of Hamilton, Vettel, Raikkonen, Verstappen, Ocon, Hulkenberg, Ricciardo, Sainz and Massa. Stroll gets Q2 underway, followed by his Williams teammate. As more drivers head out the yellows are still being waved at T4 as Palmer's car is removed. Surely they should have delayed the start of Q2. Massa posts 35.677 and Stroll 36.363. A 35.968 sees Kvyat go second and Sainz third, before both are demoted by Raikkonen who posts a 34.053. Bottas and Hamilton are trading fastest sector times, the Finn crosses the line at 33.264 - making it a Finnish 1-2 - with Hamilton posting a 33.760 moments later. Check out our Saturday gallery from Sochi, here. "Are we seeing Ferrari benefit regarding the rule tightening on trick suspension, different oils used in the engine?"